shelly's summary: A furture in the Circus! A furture in the Circus! When we went to the circus they had the pre-show before the show started so we took the kids down there to see all the stuff. 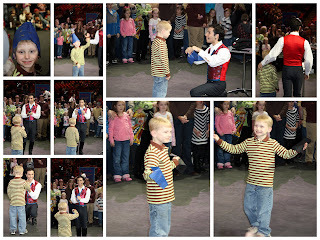 The ringmaster was doing a magic trick and needed a volunteer and Jackson got chosen to help him. He was so excited and did a really good job. He had to tear two sheets of paper in half, crumple it up in a ball, and give it back to him and he "turned" it into a hat. Jackson loved it. After that he was "all about the circus." Fun Time!